Training for the ISS Mockingbird, Colonel Sumitra Ramachandra and Major Lamarr Fitch find that they're being deployed before certification. The ISS Astraeus, an International Space Organization vessel fails to transmit its latest exploration report in the Gliese 667 System twenty-two light-years away. Colonel Ramachandra learns that the Mockingbird she commands was built for more than intra-solar operation. Three people with complicated and enigmatic backgrounds are added to her crew roster just before launch. A car with the black and silver colors of Aerospace Defense Response rolled along a vast parkway near the airstrip. Instead of wheels, it glided on four Mat Treads. The smart material enveloped, shifted, softened, and hardened according to terrain and driver intent. The machine came to a smooth halt in front of Wing Command Headquarters. A gull wing door opened to allow two black uniformed people to step out. The first was a tall lean woman of dark complexion, hair cropped short on the back and sides, with an enrapturing face and silver irises. On the right side of her collar shone an eagle and the left carried an equally glistening pin depicting three upward shooting stars. The man walking in step to her left had brown hair, brown eyes. His light toned face looked as if it might have taken a few punches, but otherwise everything remained in place. The gold leaf cluster on his right collar distinguished him as a major to the woman’s colonel rank. He opened one of the front doors for his superior officer to enter and followed her. Inside, a ceiling mounted display fixture stood in place of a front desk. It lit up with an image of a man appearing to be mid-twenties in age and matching ADR uniform. The two dimensional projection looked the same when viewed from any direction. The man wasn’t human, but an approximation of Self-Ware inhabiting the building’s quantum computer. The AI exhibited good-natured amicability. “Good. Thank you, Yani,” Sumitra acknowledged with more subdued cordiality. “With all the training we’re doing, you wouldn’t think he’d have us wait,” Lamarr muttered. Lamarr looked to say something disparaging about the government presiding over American nations, one of which he hailed from, when the door opened on its own, and cut his retort short. “Yes, come in Rama and Fitch,” the general instructed without military formality. In a moment of weakness, Sumitra caught herself eyeing the generous interior. Her office and personal quarters on the ISV-71 Raven she’d soon command for real would fit in here twice over. However, General Chaffee’s laid-back approach to command vanished before either of them entered the room, causing her to snap to attention. Lamarr matched her disciplined stance. Chaffee’s deep brown-toned skin varied a little. His hair would’ve curled tight if it hadn’t been buzzed. In this era, being seventy years old didn’t mean gray hair or many wrinkles thanks to better medical understanding of DNA repair and the gene therapy that resulted. “I realize you have been working your crew double-duty to get up to speed, but we’ll have to scrub the last two weeks,” General Chaffee announced. Rama felt as if he was warning her for the pending sucker punch. She knew it. Always pull the plug at the last goddamn minute. “We’ve got a serious situation with the FTLV Astraeus,” the general continued. “I wasn’t aware they’d returned to the solar system,” Sumitra said, in double disbelief. The two officers exchanged incredulous faces before Lamarr almost coughed out a protest. “On the way to where?” Lamarr asked. Chaffee led the other two at a brisk pace to another car pulling up with a single star on rectangular red banners above the front Mat Treads. The general’s car sped off under computer control at over forty kilometers an hour above the recommended speeds on or near airstrips. A larger military personnel bus on six treads pulled in as well. Colonel Ramachandra busied herself with the new crewmember files displaying inside of her own eyes. “You recruited a convicted bioterrorist for my crew?” Sumitra stared at him. “Anything else I should know,” Sumitra asked. ‘Much, he says’, Sumitra wanted to say, but restrained herself. The car pulled up near an aircraft ninety meters long that, at present, was blue and white with a broad one hundred fifty meter wingspan. Not far away and also ready to taxi onto a runway, was the Mockingbird’s sister ISV, the Magpie. Sumitra heard talk that the Aerospace Defense Response was going to allow mission commanders to name the ships themselves. They scrubbed the idea at the last moment, fearing a plethora of girlfriends or wives names on the sides of the craft or worse. Sumitra didn’t mind, so long as the bird was hers to command. Another car pulled up as General Chaffee, Sumitra, and Lamarr got out. Two men emerged from it, one of whom carried an external computer and a nanotube armored suitcase. “Okay, so your Spectre II firing authorization has arrived,” the general observed. ISV-71 Raven had four launch bays among its modulated components, which could deploy strategic and tactical weapons, allow the ship to do ground attacks and bombing or go nose-on with smaller fighter jets and UCAVs. The Synthesized Particle Emitter Combination Tactical Railgun or SPECTR made the sizeable aerospace craft punch well above its weight class, at least for a few shots anyway. General Chaffee returned to his car, as Sumitra and Lamarr took formation control from Chief Master Sergeant Carl Anders. Then the man did a left face and saluted Colonel Ramachandra, who returned it as crisply as received. She then turned toward the gathered formation with Major Fitch e’er at her shoulder. That got a couple chuckles and several more grins. “Dismissed.” Ramachandra handed the crew off to the Chief. “Mission. As-sume launch positions… Fallout,” Chief Anders ordered. Each flight operation crew broke out toward the debarkation and loading bay in smart order, with the mission officers and the Chief following. Men and women pounded up the ramp to the back where an airlock waited in ‘Double Open’ status. Entering after everyone else, Colonel Ramachandra made a note of the mission-specific modules the Raven Intra-Solar Vessel had been prepped with. She scrolled the inventory for the launch bays. Four configurations of pylons, each laid out for different situations. However, nothing about the ship indicated a Flipspace Device. From the outside, there would appear, to the casual observer, two crew cabins, one where a cockpit would be expected, and the other facing the rear of the main body. Yet, twenty-second century air and space flight did away with the need to for a window to fly in most cases. 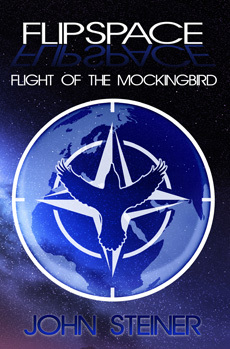 The true brains of the Mockingbird’s piloting was an AI named Maggie located just forward of the Combat Information Center in the heart of this aerospace marvel. Several backup systems existed for the Self-Ware program, Maggie to take refuge, or she could transmit herself off the ship. Ramachandra climbed to the third deck of five and made her way to the CIC; a place more cramped than old nuclear submarines of the last century. With two extra people not part of the crew, the room felt like a broom closet. Multiple unseen systems checked both Colonel Ramachandra and Major Fitch over to verify they were indeed biometrically as they appeared. Most people benefitted from artificial gene importation and medical augments. Those working in space or other hazardous environs obtained licensing for additional augmentation requiring stricter regulation. Military service people received even more. “Okay, you’re good, Colonel,” the PACT officer affirmed. “Roger that, Ma’am,” the PACT officer acknowledged as the two departed. Ramachandra took the acceleration couch designated as the Operational Command Station, as her CIC crew went through preflight checks with Maggie’s assistance. Decades ago preflight took much longer and errors in rushing it cost lives. Thrust from the Planck engines, Pulse Laser Nitrogen Capture Kinetic Engine, pushed the ISV-71 out from its boarding space onto the strip. The ship then accelerated to takeoff speed. Two sets of two-by-six, heavy-duty Mat Treads on each major landing strut rolled with the circular motion of wheels. The nose strut rested on four more treads. Most aircraft and ground vehicles no longer used wheels. The nose gear lost contact with the runway, and moments later, the main gear did the same. “ISS Mockingbird is ‘Feet Up’,” Maggie declared. Ramachandra switched her medically augmented eyes to see outside the Mockingbird. Superimposed on the real-time view appeared a successive series of squares larger than the ship passing through them. Maggie kept to the flight plan better than most humans could right to the edge of space. Just before Mach one, the Mockingbird’s wings swept back, turning its outline into an equilateral triangle. It pulled away from the curvature of the Earth while accelerating to hypersonic speeds. Next to kick in was the fifth engine, which used fusion pulse-detonation propulsion. From there, the Mockingbird made for the Fifth Lagrangian Point, one of five orbital points where gravitational forces from the Earth and moon canceled each other. The ISS Magpie had taken off minutes after and would make its own trajectory to the station. Launches bound for deep space were best from here, as it put them in a position trailing the moon. At a reduced burn of one g from the nuclear fusion engine, the flight would take four hours.